A HOP ON HOP OFF BOAT IN AMSTERDAM; WHAT’S THE DEAL? 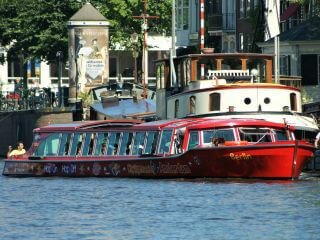 With a hop on hop off boat ticket you can go for unlimited canal sightseeing! There are one days tickets and tickets for two days. The fixed routes of the hop on hop off boats cover a large part of the city centre. Lots of sights and attractions are located close to the boat stops. And the same goes for some of the well-known shopping districts and popular areas like the Jordaan and the Pijp. So stay on the boat as long as you like and get on and off wherever you like! A HOP ON HOP OFF BOAT; WHAT’S THE DEAL? A hop on hop off boat ticket gives you maximum flexibility: stay on the boat as long as you like, and get on and off wherever you like! The fixed routes of the hop on hop off boats cover a large part of the city centre. Thet provide easy access to many sights, attractions, shopping districts and popular areas like the Jordaan and the Pijp.There are one days tickets and tickets for two days. City Sightseeing Amsterdam, with its striking red boats, is part of the large Tours & Tickets group, just like City Sightseeing’s red busses. Their combined ticket (additional price just €3) for unlimited boat and bus rides is great value for money.